When it comes to all of your future home remodeling projects, the team of professionals here at Best Home Renovations are the obvious choice when you are looking for professional, timely service that never compromises on quality. Since 1997, we have been the premier West Chicago home remodeling contractors in the area, and we have been doing everything within our power to make sure our customers get exactly what they are looking for from their West Chicago remodeling contractor services. By taking care of our clients in this way, we have developed a stellar reputation over the years for high quality service and unmatched professionalism. We listen to the needs of every individual client to make sure we understand exactly what it is they’re looking for before any work ever begins on their home. After getting a clear picture of your desires, our team of experts will show you all of the options available to you. Our team of professionals will work with you directly to help you make the best decisions about your home design based on your wants and your budget demands, and find the right options that are going to give you the design and function you are looking for from your home remodeling project. Our primary goal here at Best Home Renovations is to make sure that every customer we help is 100% satisfied with the finished results of their work. Our team of experts are always committed to delivering the best service possible when it comes to home remodeling projects in West Chicago. Give us a call today if you have any questions about our full line or professional home remodeling services, or if you would like to call and schedule your appointment for service. Our team of experts are always standing by and always willing to take your calls or answer any questions you may have. We look forward to hearing from you. There are nearly an infinite number of details that can go into your West Chicago home’s kitchen remodeling project, so where do you even begin? If you know that you need a chance in your home’s kitchen, whether you are looking for a style update, or to better customize the space to your particular needs, the professional kitchen remodeling experts at Best Home Renovations are here to help. Whether you are looking for new, custom kitchen cabinets, quartz countertops, or even new tile flooring to liven up the space, the pros at Best Home Renovations are here to help you make your kitchen dreams a reality. We can help you install that brand new kitchen island you’ve always wanted, or help you build that walk in pantry for the extra storage space you’ve been dreaming of, so give us a call today and let us show you the quality of service that has made us the most trusted kitchen remodeling contractors in the West Chicago area. When it comes to home remodeling projects, it can be easy to overlook the basement sometimes. If you are looking for a way to truly utilize all of the space in your home, a professional basement finishing project might be just what you need. There are a wealth of wonderful things you can do with this room, whether you are looking for a new family hangout space, a man cave area, a new home office, yoga studio, or almost anything else you can dream of. Call us today and let us get you the space you want. 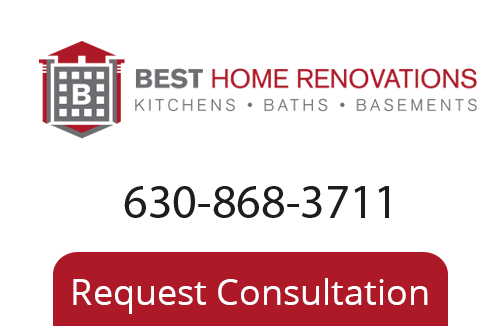 If you are looking for a professional home remodeling contractor in West Chicago, give us a call today at 630-868-3711 or fill out our online request form.